Timor Leste, the world’s newest democracy, is the sign that greets the visitor. 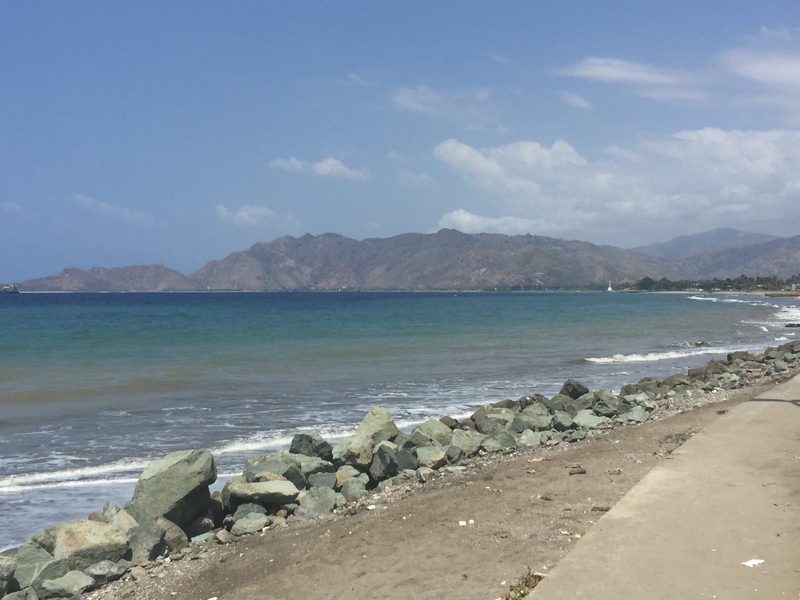 The Presidente Nicolau Lobato International Airport is reminiscent of days when one could walk in and out of airports without the hassle of security. In fact, the President’s Palace situated on the one long, main road in Dili has no signs of security only children playing in the green lawns lined with trees. The one thing which catches the eye are the throngs on young boys and girls either walking on the roads at all hours or sitting gazing at passersby. Timor Leste’s history of political instability now has a bearing on its economic and social development. In the 16th century it was colonized by Portugal and when it declared independence in 1975, it was put down in a brutal manner by Indonesia. What followed was twenty years of struggle and finally resolved through a referendum in 1999 where an overwhelming majority voted for independence. Timor Leste was officially recognized as a nation in 2002. This was not the end of its struggles. Continued political instability and civil unrest led to more riots in 2006 and following parliamentary elections in 2007. In February 2008, a rebel group staged an unsuccessful attack against the president President Ramos-Horta and Prime Minister Xanana Gusmão (who is the current President). Since then, the government has enjoyed one of its longest periods of post-independence stability, including successful 2012 elections for both the parliament and president. The conflict spanning three decades has resulted in the destruction of institutions off all kinds, loss of assets and displacement of the population. Cooperatives were not immune and many had to cease operations. Cooperatives in Timor Leste can be divided into financial and non-financial (agriculture, fishery, production..). There are now 87 credit unions, 17 agriculture cooperatives, 17 multi-purpose cooperatives and 5 fisheries cooperatives. The growth in cooperatives is largely a result of a grant programs that provides start-up funding and grants for training and support and equipment. While there is need for support, the emphasis needs to be on building human resources and capacity to sustain institutions. For example, on the financial side, credit unions work along side NGO’s with savings and loans products but the majority are credit driven. They contribute to dependency and are not sustainable in the long term when organizations pull out (which is now happening). Credit unions that incorporate the cooperative model (democratically controlled and member owned) and use savings mobilization have better chances of being sustainable. However, there is need to build human resources, instill strong governance, strengthen administrative skills and enhance technical skills. Members need to feel recognized and assisted to maximize the benefits of their individual unions. The role of the Confederacao has to be strengthened for it to provide the supervision, technical assistance and training required by the cooperative’s boards and staff. 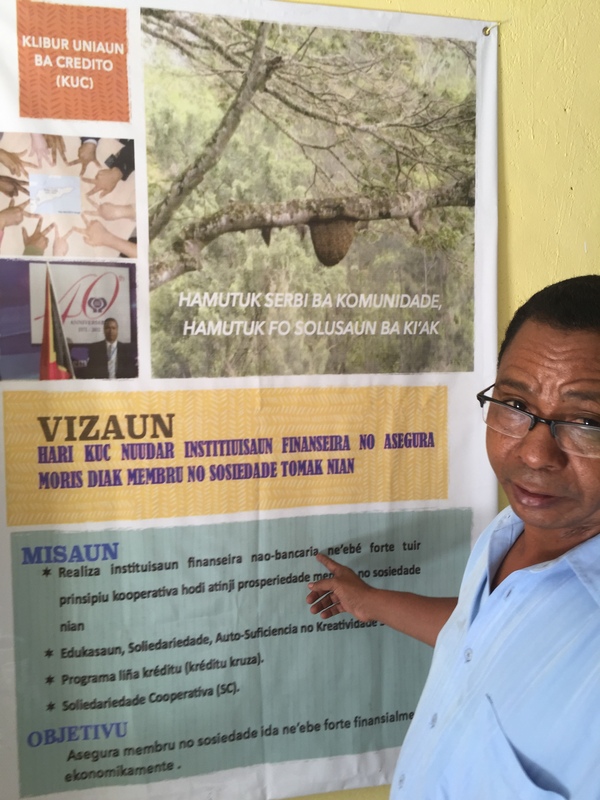 In Timor-Leste, cooperatives are now considered important enough that the constitution in Article 138 guarantees the development of cooperatives. The Timor Leste Strategic Development Plan 2011-2030 calls for developing a policy framework to establish cooperatives with vulnerable people to create employment, income and training opportunities. Forming cooperatives is another way to encourage private sector growth in rural areas. The view that cooperatives are part of the private sector is in line with the UN Sustainable Development Goals (SDGs) outcome (http://s.coop/1wv48) which acknowledges diversity of the private sector, ranging from micro-enterprises to cooperatives to multinationals and calls on all businesses to apply their creativity and innovation to solving sustainable development challenges. Mr.Abel da Costa Freitas Ximenes, Vice-Minister of Education, an ardent supporter of co-operatives was optimistic about the future of cooperatives and reiterated the government’s commitment. The Ministry was in the process of developing a national curriculum that would not only teach about cooperative values and principles but also reinforce aspects of enterprises, jobs, self-reliance and self-development. He was keen to start with two or three models that would lay the foundation for cooperatives. He said the ministry staff was in the process of starting a savings and credit cooperative for them to learn about cooperatives. We made a pilgrimage to the site where Father Albrecht Karim Arbie, SJ was buried. Known as the founder of Credit Union in Indonesia he had moved to East Timor to promote credit unions. On September 11, 1999, Father Arbie, 70, fell victim to the bullets of militiamen at the Jesuit-run refugee center. It was late night on Sept. 11, when Father Albrecht heard a man entering the compound where refugees were sheltered. He came out with a flashlight, but a man asked him to switch it off. He was then shot three times and died on the spot. Next to Father Arbie’s grave is that of Father Tarcisius Dewanto, 34, who was also killed as he tried to prevent armed militiamen from attacking the people in the church. For Robby Tulus (previously served as the ICA Asia Pacific Regional Director) it was a very emotional visit. He had last seen Father Arbie before he left for Timor Leste and had not had the opportunity to visit and pay his last respects. In addition to meeting cooperative members and leaders, I also had the opportunity to attend the training session for cadre from the credit unions and government department. Close to 40 women and men took part in the four-day training. The training was conducted by the quartet of Frans Supriyanto, Haryono Daud, Theodore Trisna and Surato with support from Robby Tulus. It was good to see the enthusiasm and involvement of the cadre in the participatory training sessions. One of the need is to develop women and men who can instill and promote the cooperative values and principles. The centrality of members their needs and involvement is paramount and this was repeatedly emphasized to the cadre who are first point of contact to members. and access to finance have to be resolved. 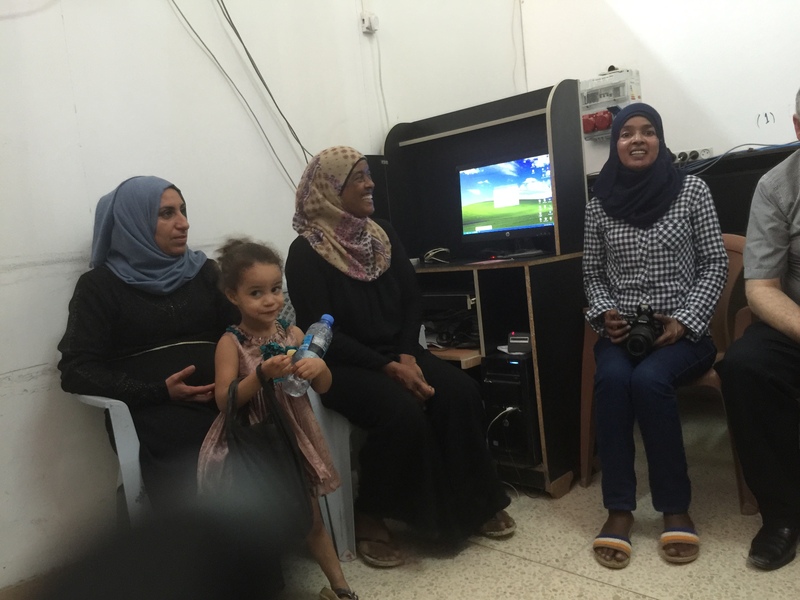 The actual visit to women run cooperatives proved the numbers otherwise. Morhaffa from Bezaria Cooperative, Hetam Suleiman from Beita Cooperative and Fatima Awatlah from the Al Noemeh Cooperative showed the difference cooperatives were making in providing not only income and employment opportunities but also addressing social needs and providing leadership. The Supermarket run by Bezaria Cooperative earned a profit of $133,030 last year, provided regular employment to 22 women and benefited 427 families. The origin of the cooperative was in its central location to three cities, Nablus, Jenin and Tulkram. While they started as an unorganized group in 2005, through support from the government and ESDC, they organized their business, merged shops and grew their business. The cooperative now has 110 members, paid-up capital of $62,900 and equity of $192,000. It has been paying regular dividend to members and patronage benefits to the users. 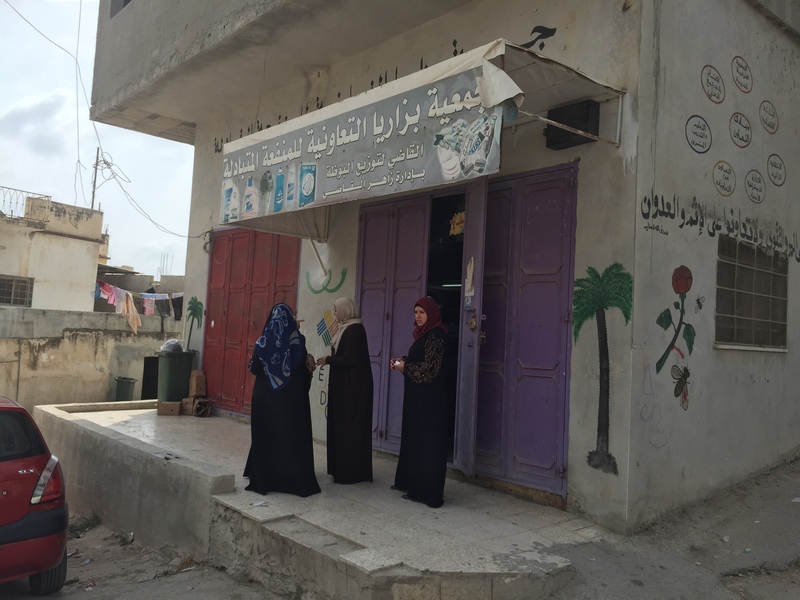 According to Morhaffa, “the cooperative provides women their own space outside of their homes. This is much needed given the situation in which we are. We hope to our own building in the near future to expand not only our business but also the psychosocial services, care for people with disabilities and rent the space for community activities.” Women from the neighboring towns visit Bezaria to learn and start their own cooperatives. 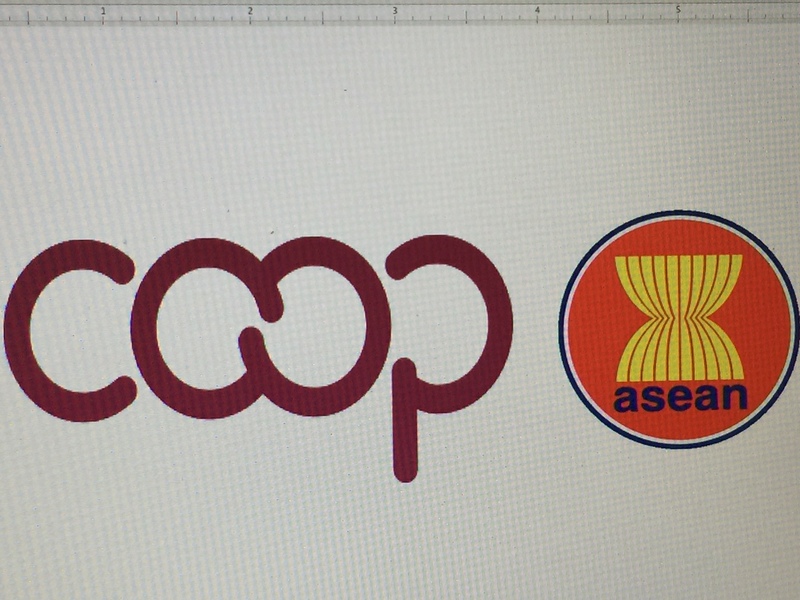 A reflection of cooperation among cooperatives! The entrepreneurial spirit of the women of Beita cooperative was evident as we entered their office. 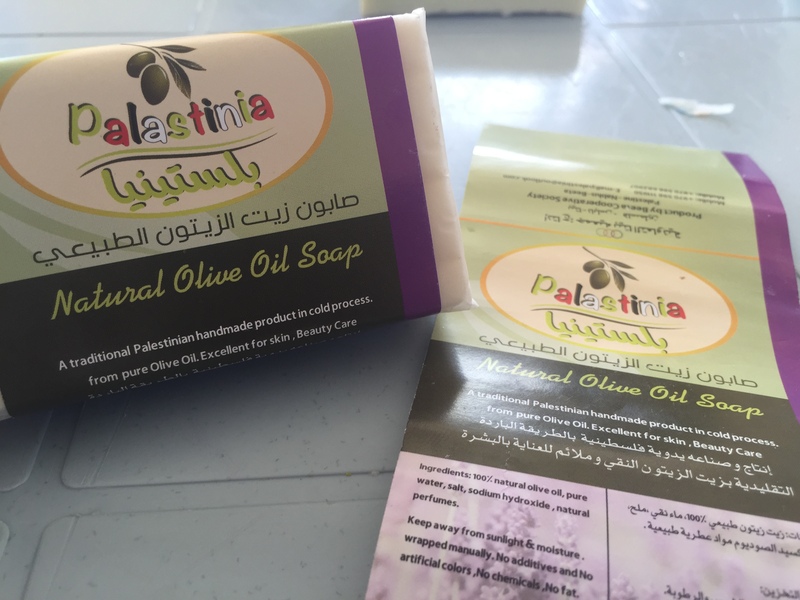 The members were busy packing olive oil soaps and proudly putting stickers with their brand name Palastinia. The cooperative when it started in 2007 was focused on agriculture and food processing, ventured into poultry and a consumer shop before finally settling on soap making. According to Hetam Suleiman, “making soap was a less risky proposition. It is a traditional product, the soap making process is familiar and it gives more work opportunity for women.” The other women in the group added, “the soap making in the initial days was in a traditional way – big size soap, without added ingredients and no packaging. We realized that in order to grow we needed to be more skilled, experiment with ingredients, focus on quality and make the packaging attractive. Brand Palastina was thus born.” The cooperative in addition to direct selling also makes soaps for private sellers. They realize that selling directly in foreign markets will give them more profits and have started this in earnest – investing in new equipment, adding to the workforce, investing in attractive packaging and reaching out to newer markets. According to UN Women, “women experience particular disadvantage in the occupied territories, where already-protective traditional attitudes are intensified by other daily restrictions. Male education is commonly prioritized, much of the limited paid work goes to men, and women are largely expected to live in the private sphere, focused on unpaid domestic tasks. Although the female literacy rate has improved in recent years, Palestine still lags on the global scale, with the numbers of illiterate women four times higher than those of men.” In their report, Building Ties: Towards Integrated Strategic & Policies for Empowering Palestinian Women, they recommend strengthening cooperatives and women run collective ventures. Collective economic ventures, cooperatives and credit cooperatives are important ways to enable women to overcome the trap of the informal sector and small business competition. These cooperatives can provide male and female participants with the capabilities to improve their skills through combining experiences and providing training and markets for marketing activities. In addition, young producers and manufacturers can exert pressure on decision-makers through joint efforts. These recommendations also resonate with those in the ICA-ILO report, Advancing gender equality: The co-operative way. The recommendations include developing and implementing gender equality strategies, tools and resources more broadly to facilitate the equal participation of women throughout the co-oper­ative movement; providing women in emerging and marginalized co-operatives with financial and technical support through co-operation among co-operatives; working with government and other partners to overcome cultural and structural barriers for women; gathering and sharing more information about best practices and lessons learned; and tracking equality indicators such as women’s participation in governance, man­agement, membership, asset ownership and income parity on an on-going basis to ensure accountability. The workshop focused on Enhancing Role of Women in Co-operative business was to bring the spotlight on women run cooperatives in Palestine. It brought together the Ministry, International Development agencies and cooperatives from Palestine and outside together to discuss the issues and share experiences. The first line, muted excitement was not totally correct! For the group consisting of cooperators from India, Kenya, Philippines and the U.S., this was the first visit to Palestine. The rich history of the region (places only seen printed in history books), the conflicted politics and its lingering impasse, and the anguished lament of the people was all very moving. The excitement was palpable and interaction with the women cooperatives did not disappoint!